With the cancellation of Ash Vs Evil Dead right before the final episode of the third season aired, there was a little bit of questioning whether the third season would actually see a blu-ray release, given how Lionsgate, the company that holds home media rights to the show, likes to NOT release films and tv shows that people want. Luckily, Lionsgate has come through and they will be releasing the third, and final season on August 21st. SANTA MONICA, CA (May 23, 2018) – Legendary horror icon Bruce Campbell (The Evil Dead Franchise) stars in the “truly insane, awe-inspiring, and gruesome” (Merrill Barr, Forbes) final season of “Ash vs Evil Dead”: Season 3, arriving on Digital May 25 and on Blu-ray™ (plus Digital) and DVD August 21 from Lionsgate. Experience the final season of the hilarious, critically acclaimed, most-watched comedy series on Starz® that follows-up the classic horror film The Evil Dead. Alongside Campbell, “Ash vs Evil Dead”: Season 3 also stars Lucy Lawless (TV’s “Xena: Warrior Princess” and “Spartacus: War of the Damned”), Ray Santiago (Meet the Fockers), Dana DeLorenzo (A Very Harold & Kumar Christmas), and newcomer Arielle Carver-O’Neill (TV’s “Worst Year of My Life, Again!” and “Suburbs”). “Ash vs Evil Dead”: Season 3 features Ash, who – having gone from urban legend to hometown hero –discovers that he has a daughter. And, when Kelly witnesses a massacre with Ruby’s fingerprints all over it, she returns to warn Ash and Pablo. 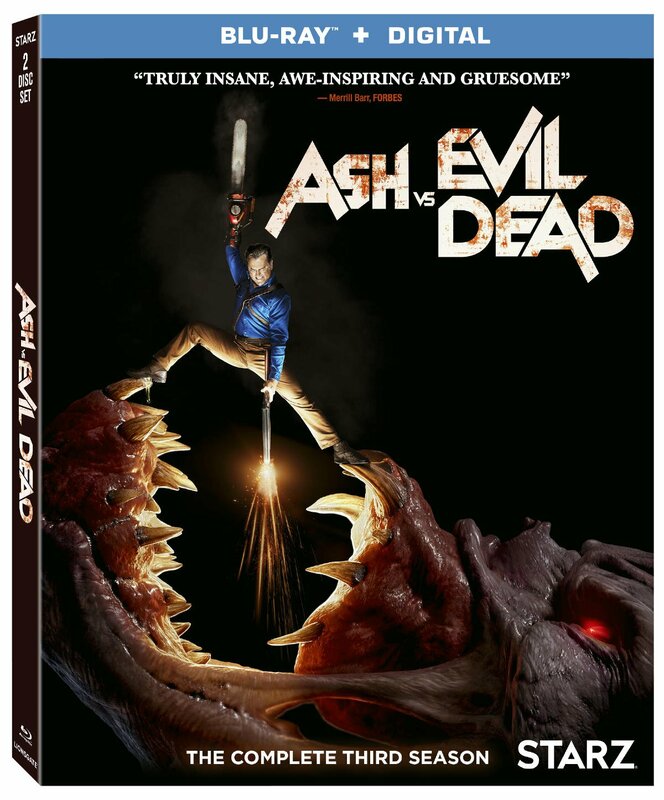 The “Ash vs Evil Dead”: Season 3 Blu-ray and DVD include audio commentary with executive producer Rob Tapert on every single episode, and will be available for the suggested retail price of $39.97 and $34.98, respectively. Title Copyright: Ash vs Evil Dead © 2018 Starz Entertainment, LLC. All Rights Reserved. Artwork & Supplementary Materials © 2018 Lions Gate Entertainment Inc. All Rights Reserved.